Oh baby, this is why I love band reunions or should I say band revivals. For this is one on-fire, cranked-up, slammin’ and funkified fusion fest. John Goodsall, Percy Jones, and the gang whirl you around by your heels until your brain pops. 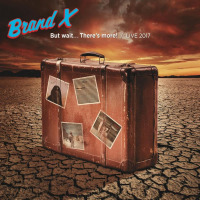 Being a dormant entity for most of the ‘80s, Brand X is obviously very much back with this second post-reunited offering. With drummer Frank Katz and vibesman Mark Wagnon from Jones’ Tunnels band  Brand X is manifesting a destiny of attack and decimate. Jones’ signature jazzy-phat, swelling, be-boppin’, hip-hopped, and burpin’ funk-rock bass is framed with that serrated-edged and pyrotechnic splendor in Goodsall’s mean fusion guitar. Those of us fully aware of the fascinating diversity and skillful jazz rock of early Brand X will also remember how complexly whacked and offbeat they could stretch  they defied old genre-specific boundaries and set new ones. The same flagrant disregard is thankfully in full swing here. My mind goes back to Do They Hurt? crossed with Livestock. For that in-your-face bombastic and killer guitar-driven fusion check out “True to the Clik”, “Virus”, “Manifest Destiny”, and “Operation Hearts and Minds”. For that world and ethnic syncopated funk fusion that Brand X has always handled with ease do “XXL”, “The Worst Man”, and “Drum Ddu”. Last track, “Mr. Bubble Goes to Hollywood” is a drum solo then drums-n-bass duet. Probably one of the most memorable cuts is Jones’ “Stellerator”, named after one H. F.Mudd’s robo-wife device from an early Star Trek episode. 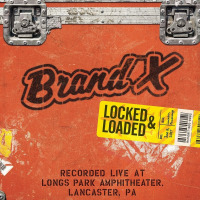 This song held all Brand X was famous for in its olden days. 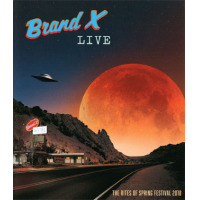 It recalled the grace of Bruford and the retained the quirky-edged abandon of Brand X. Great stuff! Goodsall dabbles in Frippian territory ever so briefly. A bonus is two live cuts “hidden”  Oops I told ya  as unlisted tracks 11 and 12. Strongly recommended.